I recently had the opportunity to try out some new flexible solar modules from Solbian. I was generally impressed with their design and efficiency. ALLinONE semi-flexible solar modules (AiO) from Solbian are not like other flexible solar modules currently on the market. 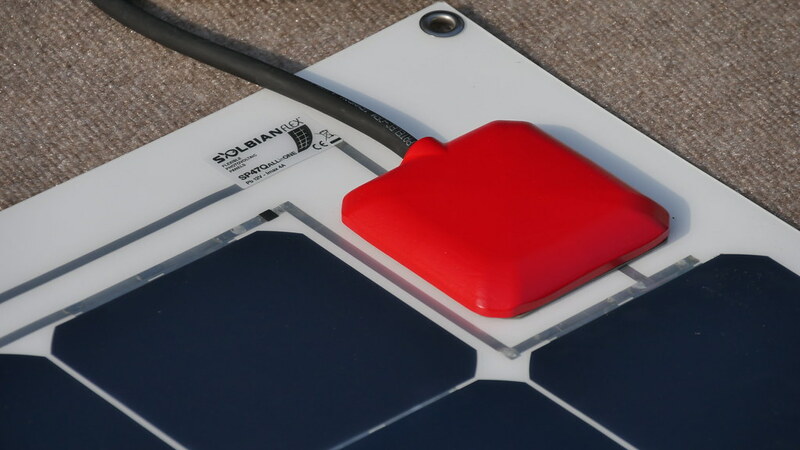 Their innovative design combines a high-performance solar panel with an onboard MPPT solar charge controller. Everything necessary to charge a deep cycle battery is included on the module. All that is required is to mount the ALLinONE (AiO) panel and connect the positive and negative leads to a deep cycle battery. One of the cells on the panel is replaced with a small MPPT solar charge controller. The onboard MPPT controller boosts the energy collected from the remaining high-efficiency SunPower Maxeon solar cells. Having the ability to generate DC power from solar and regulate the output to effectively charge a battery makes the ALLinONE a complete charging solution. Despite having one less solar cell, the ALLinONE 47 watt modules I tested matched, and often exceed, the energy output of similarly sized solar panels that I’ve tested. 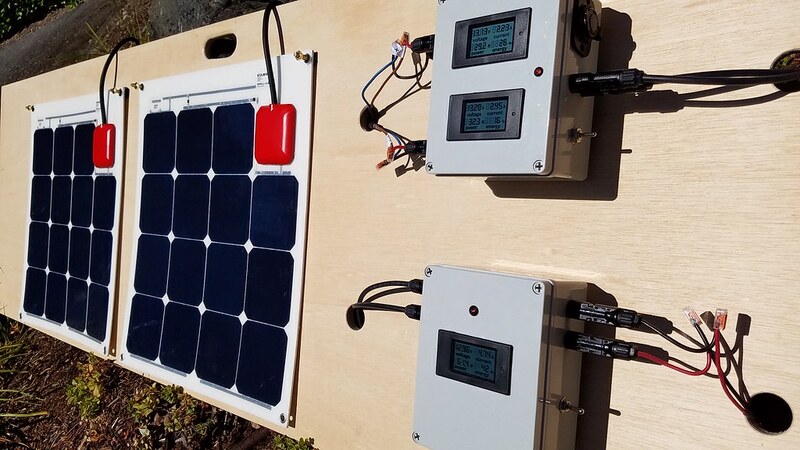 IS IT A SOLAR PANEL or a CHARGE CONTROLLER? The positive and negative output of of these modules come directly out of the MPPT solar charge controller. Therefore the ALLinONE modules function as a solar charge controller with a solar power source. The output voltage produced is regulated by the MPPT charge controller to efficiently charge a deep cycle battery. This is the primary distinction to make between the ALLinONE solar modules and other solar panels. As solar charge controllers, you would never connect these to other solar panels in series. You could, however, use multiple ALLinONE modules together in parallel to boost your battery charging capacity. This type of configuration actually has significant benefits especially in partial shade situations. I demonstrated this feature in the video above. The benefit in a single panel install is simplicity and ease-of-use. There is no need to match a suitable charge controller to your solar panel. Simply connect the ALLinONE module to your battery and it will start charging as needed. But could an all-in-one unit also be viewed as a disadvange? One might argue that having the MPPT charge controller built-in to the solar panel creates a single point of failure. Should something go wrong with either the solar cells or MPPT controller, then the entire module is unusable. Of course, the same could be said about losing you’re entire array due to a centralized MPPT controller failure. In either case, it is always smart to have a backup plan if solar charging is essential to your application. Before we dive into the benefits of combining modules in parallel, I should point out that these solar modules should never be connected to other solar panels in an array. You should treat ALLinONE modules as MPPT charge controllers instead of solar panels. As charge controllers they should be connected only to a battery or battery bank. They can also be combined in parallel with other solar charge controllers (typically through a combiner) to charge batteries. When combined in parallel with other ALLinONE solar modules, the task of charging batteries is shared across all MPPT charge controllers. This is called a distributed MPPT configuration and has some advantages over the traditional central solar charge controller setup. Charging of the battery is distributed across all MPPT charge controllers connected to the battery. Each module behaves as a separate charging source. Therefore, any fluctuation or drop in output of one module will not affect the performance of another. This type of distrubuted MPPT configuration is not uncommon in solar installations where peak efficiency is essential and when fluctuations can not be avoided. If not using ALLinONE modules for distributed MPPT, each solar panel required a separate dedicated MPPT charge controller. The ALLinONE modules take this a step further by including the MPPT controller right on the solar panel. As a result, the output of the ALLinONE solar module is actually charging output of the MPPT charge controller. For this reason, you are not able to directly measure the output and efficiency of the solar cells on the ALLinONE. You can only test the function of the MPPT charge controller as it charges a battery. How Many ALLinONE Modules Can You Use? The number of ALLinONE modules you can use together will depend on the amp hour capacity of your battery bank. For a lead acid battery, the charging current (in amps) should generally not exceed 10 percent of the overall battery capacity in amp hours. For a 100 Ah battery bank, the total current of all MPPT controllers combined should not exceed 10 amps. For a 200 Ah battery bank, you can go up to 20 amps. Note: This is just a general rule-of-thumb. Check with your battery manufacturer for recommended charge levels. Is this a more expensive option than a traditional multi-panel single MPPT configuration? A: That depends on the size of your solar array and cost of your existing components. If you have inexpensive solar modules and charge controller, then YES an equivalent distributed MPPT configuration will be more expensive. If you have several high-end solar panels and an expensive MPPT charge controller, than it could be comparable in price. Do a cost comparison of the two options figuring in all of the necessary hardware. If I’m not worried about partial shading. Is it worth considering? A: This type of distributed configuration has other advantages which can make your system more robust and fault tolerant. It may be worthwhile if you can justify the higher up-front cost. Can I use ALLinONE modules with my existing solar array and controller? A: Yes. However they must be connected in parallel with your existing solar charge controller(s) to charge a battery bank. ALLinONE panels should never be connected directly to other solar panels as part of a larger solar array. They are sold worldwide through distributors. Here is a list of North American Solbian distributors. Solbian’s primary North American distrubutor OceanPlanet Energy recommends contacting Brian Johnson of BRJ Solutions in Seattle for any technical questions regarding ALLinONE solar panels. A distributed MPPT solution is simply one option. Whether it is viable for your installation will depend on your circumstances. Thanks to Solbian for providing these panels for review.